(APN) DEKALB COUNTY — Last night, on Tuesday, November 03, 2015, DeKalb County voters bucked the trend toward cityhood in Metro Atlanta, by narrowly rejecting the proposal for a new city of LaVista Hills in the northwest part of DeKalb County. The proposed City of LaVista Hills lost by only 136 votes. The final vote count was 6,925 nays or 50.50 percent; and 6,789 yeas or 49.50 percent. At the same time, voters made Tucker a city by an overwhelming margin of 3,937 yeas or 73.92 percent to 1,389 nays or 26.08 percent. This is the first no vote on cityhood by majority White voters in the Metro Atlanta area, since the trend began with Sandy Springs in 2005 after Republicans gained control in the State Legislature and made it easier to create new cities. Following Sandy Springs, were incorporation of Milton, Johns Creek, and Chattahoochee Hills in Fulton County; Dunwoody and Brookhaven in DeKalb County; and Peachtree Corners in Gwinnett. In 2007, a majority Black electorate voted down a proposed City of South Fulton as well. From the beginning, the issue of cityhood throughout Metro Atlanta has been fraught with charges of racism and politics. Mainly because many residents in the Whiter and wealthier parts of North Fulton and DeKalb have said they do not wish to see their tax dollars going to support South Fulton and DeKalb which are heavily populated by Blacks. The new cities in DeKalb are sucking up lucrative commercial property that is starving the County of tax revenue. At the beginning of Election Day, some voters in the proposed City of LaVista Hills did not see the cityhood referendum on their ballot, and initially were not allowed to vote. That error was quickly remedied early in the day, and only one voter is estimated to have been affected. APN asked Allen Venet, President and Chairperson of LaVista Hills Yes, if they plan to eventually start the cityhood process over sometime in the future. “Right now we don’t know what is going to happen in the future. It is too soon to say, we don’t have any plans at this time. We are all just trying to figure out where we go from here, if anywhere,” Venet told APN. LaVista Hills cityhood was a hotly contested race, passionately debated in community meetings, in homes, and in restaurants for months. Atlanta Progressive News attended and reported upon several of these meetings. 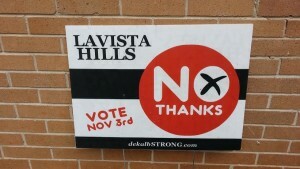 The flyer implied to seniors that if they did not vote for LaVista Hills, they could lose their senior property tax exemption, which the flyer stated would have been provided in LaVista Hills, but not in Atlanta. Supporters of LaVista Hills had wanted to separate from DeKalb County Government, citing all the allegations of corruption and criminal behavior in the county government. They wanted more local control and their own police force. Opponents of LaVista Hills said, however, that another layer of government was no guarantee that cronyism and corruption would not crop up in the new city. Nor would another city fix the problems in DeKalb County Government. Marjorie Hall Snook, Board Member with DeKalb Strong, tells APN they are very happy with yesterday’s results. “We are a grassroots group of activists that went against a very politically connected group of people and we won,” Snook told APN. “The margin was very small and what that means to us is that every single little thing that we did, every person who knocked on doors, every editorial, every public meeting – all of it could have made the difference. I think yesterday was a victory for equity, unity, and common sense,” Snook told APN. Levetan explained in the article that she is disgusted with the quagmire of political corruption, incompetence, and rank cronyism in DeKalb County government. However, Levetan said she was not convinced the City of LaVista Hills could have supported itself, adding that the problems in DeKalb County government cannot be fixed by trying to divorce ourselves from the county government. In the race for State Senator, District 43, former Rockdale Commissioner Janice Van Ness (District 2), a Republican, and State Rep. Tonya Anderson (D-Lithonia) have gone into a Run-off, with Van Ness receiving 37 percent of the vote and Anderson receiving 26 percent. The District includes parts of DeKalb, Newton, and Rockdale counties. In the race to replace State Rep. Anderson in House District 92, Democratic candidate Doreen Carter won with 53 percent of the vote against her Democratic challenger Sherri Washington with 47 percent of the vote. In 2014, Carter was the Democratic nominee for Secretary of State, and received APN’s endorsement. The DeKalb County question to revise the Board of Ethics for DeKalb County got a whooping 91 percent of the vote in favor. UPDATE 1: A previous version of this article incorrectly stated that the LaVista Hills vote was the first no vote in Metro Atlanta since 2005; however, it is the second, following the South Fulton vote in 2007. Fact check. The La Vista Hills no vote is not the first no vote since the incorporation trend started with Sandy Springs in 2005. We have issued a correction and update, thank you.